This is probably my favorite playing style – double stops. Double stops means playing two notes at the same time and was employed to great effect by a certain Mr James Hendrix. 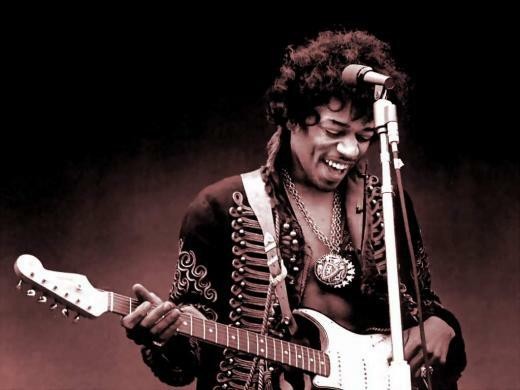 Hendrix is known by non musicians for his wailing solos but this style used on gentler songs like Little Wing and Castles Made of Sand is perfect for playing in worship settings. The easiest way to understand double stops is by fretting a chord and playing any two adjacent strings. Then as the sound rings, use a spare finger to fret another note in the key on at least one of those strings. If you can add hammer-ons and pull-offs it will add to the overall texture too. The key to this style is to think of it as lead guitar but using chords as a base rather than scales. It works very well with the CAGED system I talk about in the Musicademy Intermediate Guitar DVDs but even if you’re not familiar with that you can still get some good results from a couple of basic shapes. To demo this we are going to play some licks around an E chord. Barre your index finger across strings 1-5 at fret 9 leaving the low E open. Now place your ring finger on the G string (3) fret 11 and play the two middle strings. The combination of pulling that third finger on and off will give you the notes of E, F# and B. The same can be done for any other note in the key of E using this same shape, so keep your index finger at fret 9 and play any of the other notes marked with a red dot. Try any two adjacent strings and see what results you get. It will work particularly well if those red dot notes match up to any of the notes in the chord you are playing over. You are doing what’s now known as little winging it. 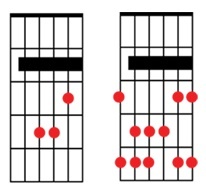 Even though we are in E this shape is based around the G shape in the CAGED system so bringing the barre up to fret 12 will help you play around in G, fret 7 will be D, fret 5 is C Fret 2 is A and so on. So give it a try. For the minor chords start off by using an Em minor barre chord up on the 7th fret which is an Am shape. Start again by playing any 2 strings and take on and off fingers 2, 3 or 4. So really any finger apart from the barred index finger. Next use any free finger to play other notes in the key of Em as outlined in red. Once again find other minor chords by sliding the barre up and down so Dm is fret 5, Bm fret 2 etc. So, if you are playing lead guitar this is a great textural alternative to using pentatonic scales which can sound pretty ‘widdly-widdly’ in the context of a lot of modern worship song styles. Use a clean slightly driven sound with long reverb for great results and even add delay or chorus effects to taste. If you use a pick play those two strings hard you’ll get some really percussive guitar tones. Apart from the Hendrix classics also check out a James Taylor song called Everybody Loves to Cha Cha Cha. The double stops licks played by Michael Landau are some of the sweetest you’ve ever heard!